Here is my final blog post journeying through Carly Marie's, fellow baby loss momma, topics about grief. 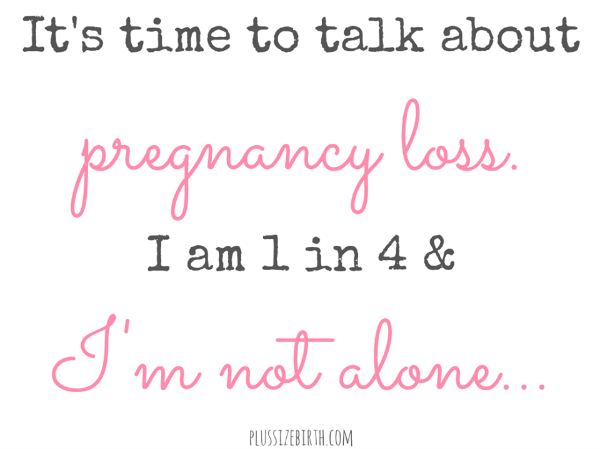 I've enjoyed reflecting on these subjects as a way to continue the discussion about pregnancy and infant loss. I'm so thankful I have this blog to use as a platform for worthy causes such as this. The sixteenth subject was CREATIVE GRIEF. The question asked with this topic was, " Have you done anything in memory of your child? Maybe it is something you created for them." My response to this is, yes. I did create something for Angel - this blog. I started this blog as a way to work through my grief via writing, but it quickly became something I could use to remember her and honor her. For those reasons and others, my blog makes me happy. The seventeenth subject was SECONDARY LOSSES. Here is how Carly Marie describes this: "When your child dies, there are a series of secondary losses that follow. They are different for everyone. The loss of relationships, the loss of innocence, the loss of employment etc. Share about something else that you lost when your child died. This is the perfect way for us to shine a light on the grief experience." For me, I lost my naivety surrounding pregnancy. My pregnancy before I lost Angel - my pregnancy with Beth - was pure bliss. I never worried a single second about her. I never doubted for a moment after seeing the positive pregnancy test that I would bring home a healthy baby after nine months. However, my pregnancy after losing Angel - my pregnancy with Hannah - I struggled with worry and fear from the moment I saw the positive pregnancy test. Those nine months I spent pregnant with Hannah hardly enjoyable because I finally understood how fragile life on this earth really is. And it scared me. Even after she was born. I worried. And even now, I worry. Loss makes it hard to enjoy the present because of the memory of what has past. The eighteenth subject was SEASONS AND SYMBOLS. The nineteenth subject was MUSIC. This is the song I consider Angel's song: "Still" by Gerrit Hofsink. The twentieth subject was FORGIVENESS AND HUMANITY. "When you forgive another person, you are not condoning their actions; you are just accepting their humanity and releasing yourself from them." This is something a Christian should excel at given how much we have been forgiven by Jesus. I've had to forgive others, and it's easier to do so when you consider our fallible humanity. My prayer is that my family and friends forgive me when I err - which I often do. Most especially, I pray that those who experienced a loss before I experienced mine, forgive me for my insensitive remarks upon their losses and for not doing more then to ease their pain. I'm sorry. I wish I had stopped a moment to really consider what you were going through and what I should do to help. If I haven't asked you before, I ask you now. Please forgive me for my words and my inaction. The twenty-first subject was SACRED PLACE. The question here was, "Do you have a special place that you visit to 'be' with your children?" I don't have an out of home location, but in our bedroom, I do have a memory box that contains Angel's ultrasound picture and a few other mementos. 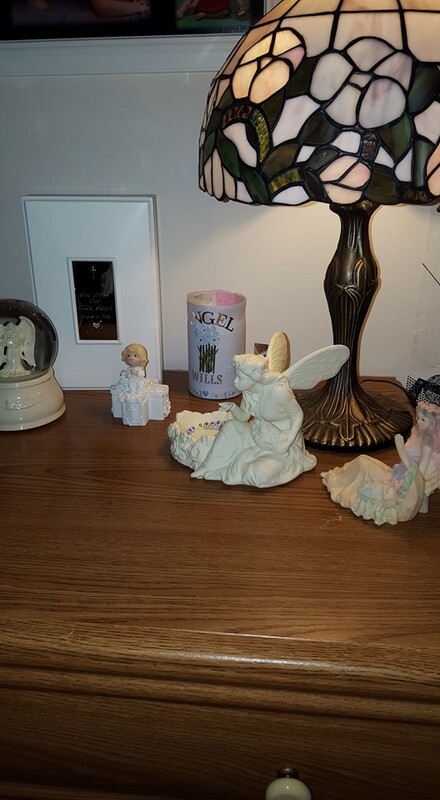 Her special candle that I light every August 5th and October 15th is right beside it along with a few other treasured objects that were given to me in memory of her. The twenty-second day was DREAMS AND RITUALS. I don't really dream about Angel, but I do have some things I do annually in honor of her and in remembrance of her. I've already talked about how I light her candle on the day of her loss and during the international wave of light, but the other thing that has become a ritual for me is to participate in a 5K in honor of her and babies lost too soon. I truly look forward to running for her and others. The twenty-third day was LOVE LETTER. The twenty-fourth day was CHOOSING YOUR BREATH. "Conscious grief work is so important if you want to create a beautiful life after loss. 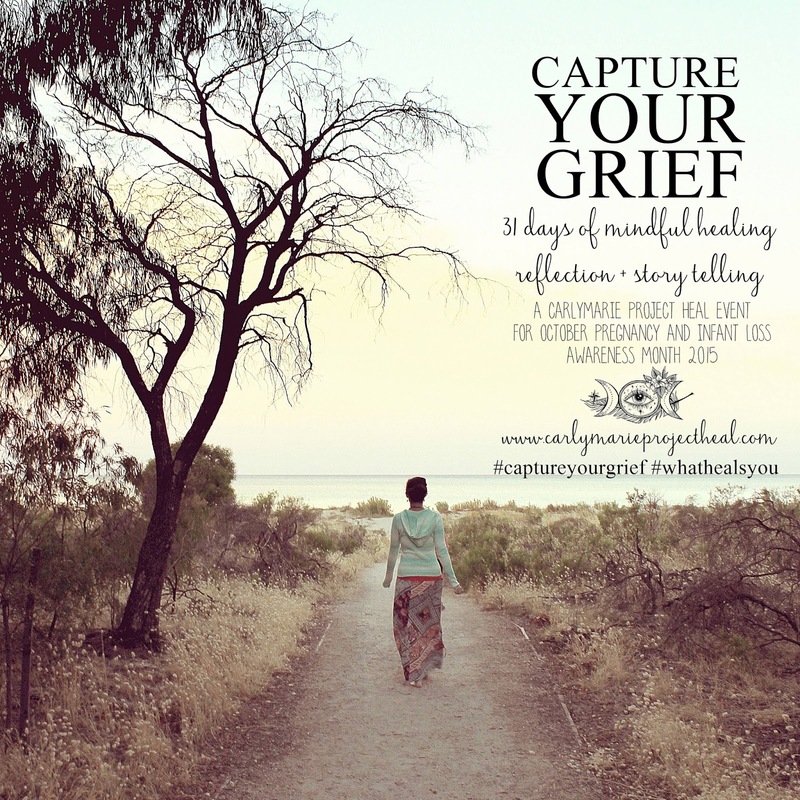 Have you ever sat down and really thought about where you are in your grief journey?" 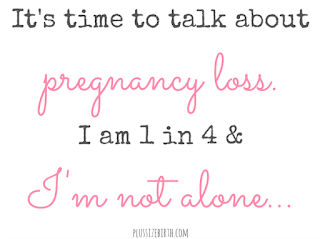 It has been five years since my miscarriage, and I'm in a good place on my grief journey. There are some who may think I am not because I continue to talk about the baby I lost, but they would be very wrong in their assumption that someone who strives to remember her baby by talking about that child is having difficulty with her grief. To begin with, you never stop grieving the loss of a child, so you can stop waiting for that to happen. And secondly, don't expect a mom to just "get it over it" and "move on" by silencing herself. Not talking about her child is the worst thing a momma who has lost her child could do. We have to talk about our babies. We must. I think it's a sign of being in a good place on the journey that is grief from loss of a child when a momma can talk about that child. The twenty-fifth day was EARTH REMEMBRANCE. I found these memorial stones on the october15th.com website store. 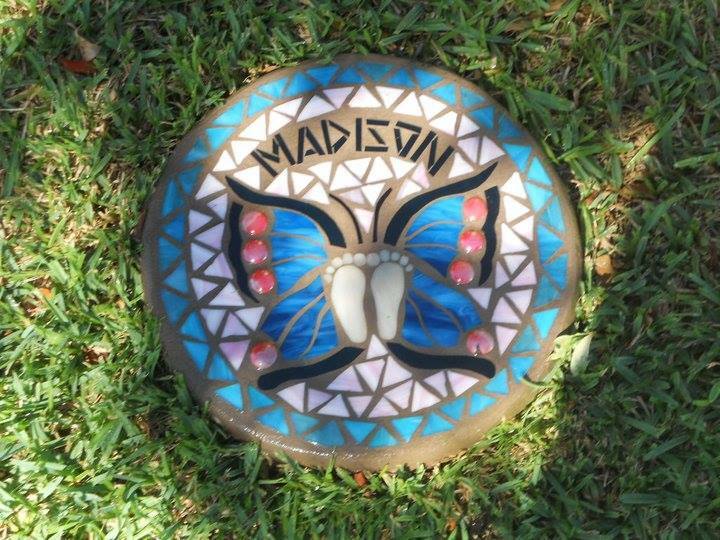 I want to get one that has Angel's name and place it between the two azalea bushes representing my other girls. This plan makes me happy. The twenty-sixth day was GRATITUDE. Having an attitude of gratitude really does help to improve your mood and sends your overall quality of life on the upward path. For that reason, I highly suggest taking the time to count your "blessings." So, here it goes... I'm thankful for many things. I'm thankful for being not only Beth's and Hannah's momma but also Angel's. I'm thankful for an understanding husband. I'm thankful Jesus is our Lord and Savior. I'm thankful for the life of relative ease we live and the jobs that afford us that ease. My glass is more than half full. How about yours? The twenty-seventh day was SELF-PORTRAIT. After losing Angel, it took awhile to get comfortable with my new reality. But I can finally say after five years, I am not ashamed of who I am. The twenty-eighth day was REACH OUT. The twenty-ninth day was WHAT HEALS YOU? I have many answers to this question; it just depends on the day. First and foremost, Jesus heals me. And He uses many things to help me heal: hot chocolate, writing, friends, running, sleep, and chocolate (did I say that already ;-). The point is that I am healing. And my complete healing will come when I am with my savior and my Angel again one day. The thirtieth day was REFLECTION. 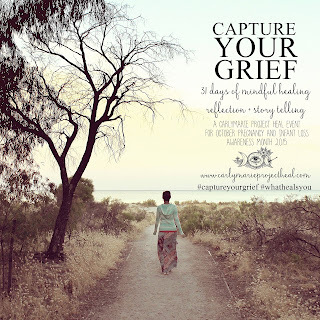 Carly Marie's Capture Your Grief project has been a great vehicle for reflection. So much has happened in the last five years since Angel's loss. Finally, I can see how God can work all things together for the good of those that love Him. I can celebrate what Angel's short life has meant to me and how it has shaped me. I can take pride in the things I have done since then to honor her and remember her. I'm in a good place. I pray you find this good place eventually in your journey of grief. And tomorrow is the thirty-first day. The subject is SUNSET. 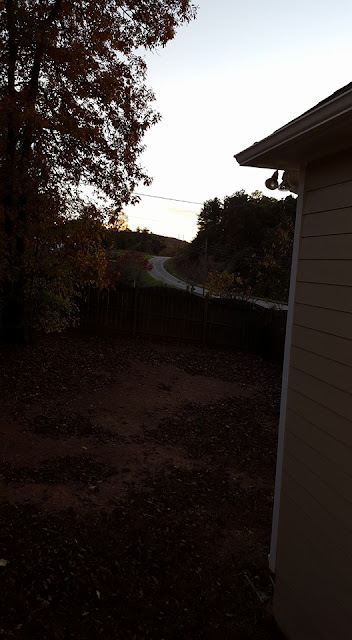 I went ahead and took my picture of the sun setting tonight because I wanted to get this post done and shared now. As I said before, I have enjoyed participating in the project, and I would encourage you to journey through it as well if you have experienced a loss. God bless!